I Love You More Than Carrots: M3 Bumpdate :: 18 Weeks! How Far Along: 18 weeks as of today! Totally forgot about week 17. Damn, these weeks just fly by, especially around the holidays! Also, 18? Already? Total Weight Gain: Check back in approximately twenty-nine weeks although some days it looks like my bump is considerably smaller than the week before. Symptoms: Heartburn, hip aches and insomnia. It's like the Pregnant Woman's Symptom Trifecta. Maternity Clothes: I really don't understand why people complain about there not being any affordable, stylish maternity clothes out there. Old Navy and GAP are having (had and will continue to have) killer sales on all of their clothes and you really can't go wrong with either for price and quality. I'll admit, some of my Old Navy stuff tends to wear out after the year but at the price point they offer especially with a discount? I don't mind replacing it the following pregnancy. ASOS continues to be a go-to for more trendier pieces and I'll be looking back there towards the end of next month when I need something to wear to that black-tie affair! Let's take another quick minute to talk about how adorable this sequin patch tunic is from Molly Suzanne. I am a sucker for anything with elbow patches and, well, glitter elbow patches? Mind blown. 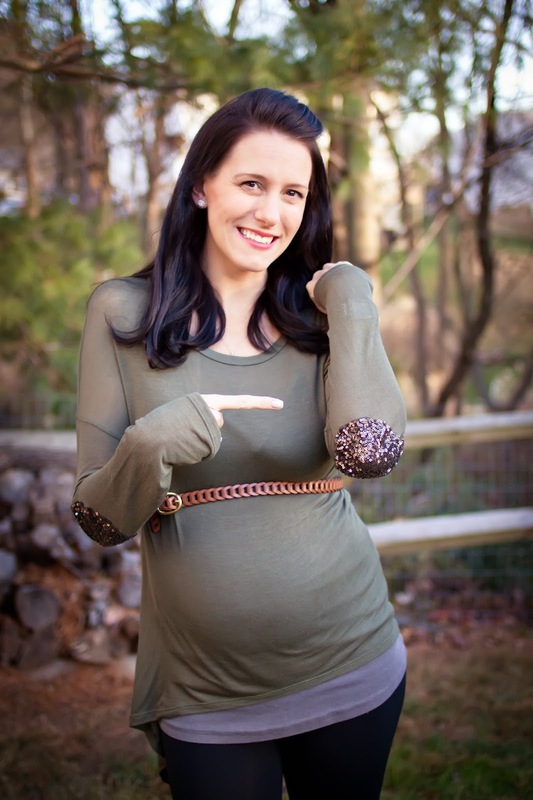 It's a great versatile non-maternity piece that fits great over the growing belly and is long enough to cover my tush, making it perfect to wear with leggings! Gender: A beautiful baby boy. Our third, sweet and wonderful bundle of blue. Movement: I officially feel M3 all the time and it's just so ridiculously awesome. I can't help but think how foolish I must look every time that wild grin spreads across my face. I don't even want to forget what this feels like- even when the soft pokes become uncomfortable jabs and punches. Right now I feel him mostly when I'm sitting- at the table, the desk, the couch, etc. Sleep: Terrible. That is all. Cravings: Always spicy. Spicy anything. The spicier the better. Give me all the spicy things. Thinking Names: Still thinking about the one name that Husby and I agree on. Middle names are throwing us for a loop but if we can successfully think of an "M" middle name, the baby will share the same initials as his older brother, Carter. I like to think that reminding my husband how great it will be to reuse all of that monogrammed clothing will push him into 100% agreeing on the name we've chosen. Funny Moments: Maclane is obsessed with pulling up my shirt and pointing out my "belly, belly!" I guess I should be thankful that he's not showing off his beloved drinks instead but literally, every available moment, he rips up my shirt and shouts "BEYYY-BEYY!" Not embarrassing in the least, I swear. Not So Funny Moments: Maclane's obsession with sharing my belly in public places... like the park and Chick-Fil-A. Nesting: Wanting to fix, paint and decorate anything and everything in our house but not exactly having the budget to allow such nesting is driving me absolutely insane. Trying to space out our "projects" and realizing that we have at least one project to take on every month between now and M3's arrival. Best Moments this week: Feeling M3 move around in there on the regular. Looking Forward To: Eating my pregnant way through Thanksgiving and hosting our very first "Cookies and Cocktails" party in early December! Can't stand the cute! Love it! I love the tunic. Do you think the have to have all spicy things cravings intensifies the heartburn :) I typically LOVE spicy but when my throat is on fire 99% of the time, enough spicy for me. GIVE ME TUMS ALL THE TUMS! Course water, specifically ICE water is my biggest craving (so boring) for the second pregnancy in a row.... I want to be able to request ice cream with pickles and french fries at 12AM and the huband will go get it. No such luck (YET). You look absolutely adorable! Just beautiful, friend! Can't wait to hear the name. You are pretty darn adorable, girl! Can't wait to hear your name choice! 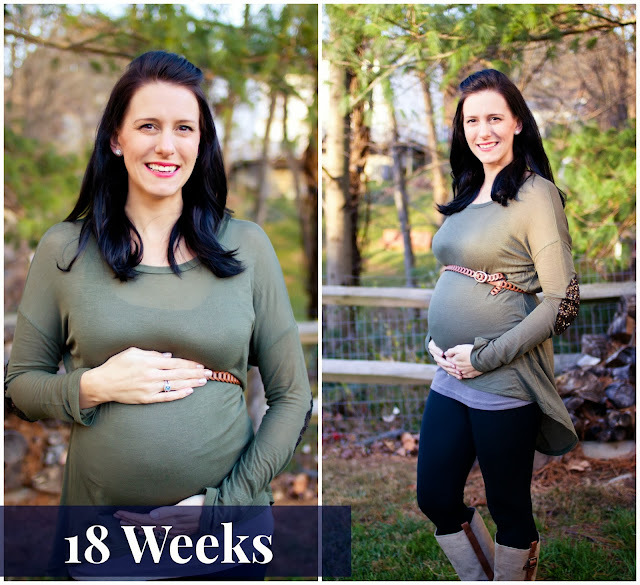 I totally agree on the Old Navy and GAP maternity clothes! I am living in them right now. You can't beat the price or the comfort! Also, love the name! And you look amazing (your hair is unbelievable!!!)! Happy 18 weeks! You know an M name that I am loving right name...Monroe!! If I was to be super crazy and decide to have one more and if it was a girl, I would name her Eden Monroe. All I am wearing these days (at 31 weeks!) is from Old Navy and Gap, and I am loving them! I've made a few orders, and each time, ended up with several items and didn't spend more than $60, I think! You look great, and I like the sparkly elbows! I lol'd at "showing off his beloved drinks". Sweet and onery Maclane. I craved spicy food like CRAZY when I was pregnant with East. That's probably why I came a couple of weeks early ;-) Oh and that tunic? Love. a C name! i can't wait to hear it! and you look so great! You look great! So pretty! Haha Maclane! So cute. Congratulations on having another boy! I'm 20 weeks pregnant with my first & just found out last week that I'm having a boy too!! This week my sleep started to go downhill because my belly is getting to big!! I need a pregnancy pillow asap!! Heartburn and hip pain here. I hope sleep gets better for you! cookies and cocktails party! I must know what this is.